This c.1773 instrument was produced in the year George Adams Snr (c.1709-73) died. Unusually, it is signed Ann and George Adams – A & G Adams at No 60 Fleet Street, London. This is a reference to his second wife and son who traded under this name for just two years from 1773-75. 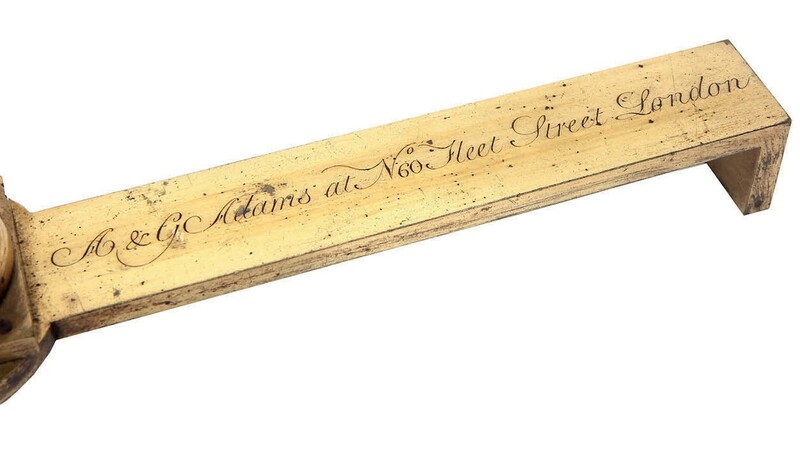 When George Adams Jnr (1750-95) had completed his apprenticeship, the company took his name. Flints’ instruments specialist Matt Nunn said it is rare to have an instrument of this period signed by a woman and is the only example he is aware of that is signed by both wife and son. Adams first describes his ‘variable’ microscope in 1771 in the fourth edition of his Micrographia Illastrata. 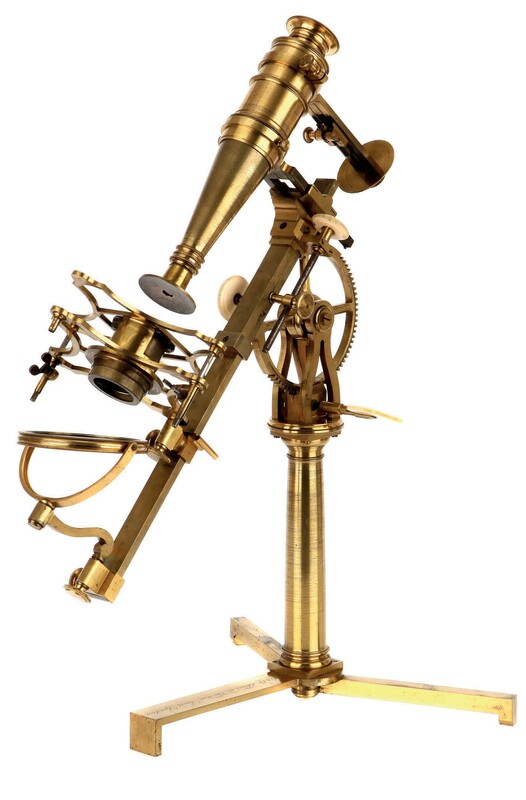 Reginald Clay and Thomas Court, authors of The History of the Microscope, say it was the first microscope to offer the option of increasing the magnification by ‘compounding’ the objective lenses. The inscription for Ann and George Adams. Only a handful of Adams variable microscopes – that could be used as a simple microscope using just one lens or as a compound microscope using many lenses – are known to exist. Nunn says that “not many were made, they were very expensive at the time, and they were not well made, so did not survive. In particular, a large pinion and gear to adjust the viewing angle was prone to damage and not easy to use“. He added that the example in London’s Science Museum is incomplete. This example, kept in a sideboard in a home in the south of England, was in good condition. The estimate of £10,000-15,000 proved conservative, although no model of this type had been offered at auction before. 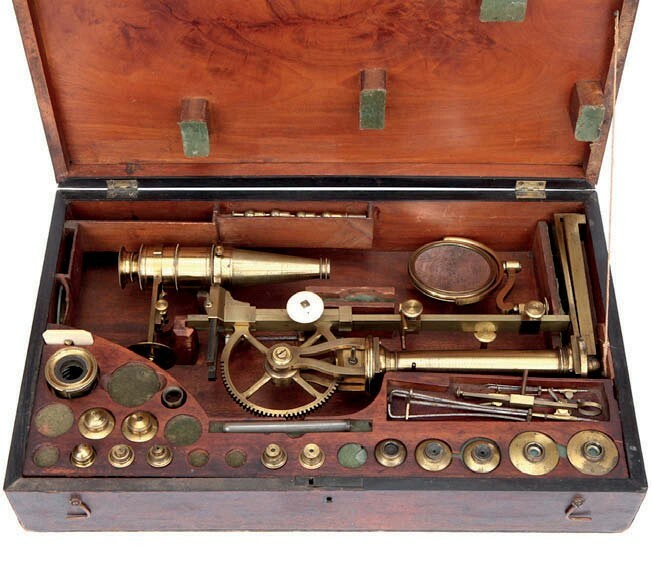 The microscope was sold during Flints’ two day Fine Photographica & Instruments of Science & Medicine on April 26-27. Competition came from phone bidders in Europe and North America against interest online, with the winning buyer a US museum.